Posted on the Faceplant group. 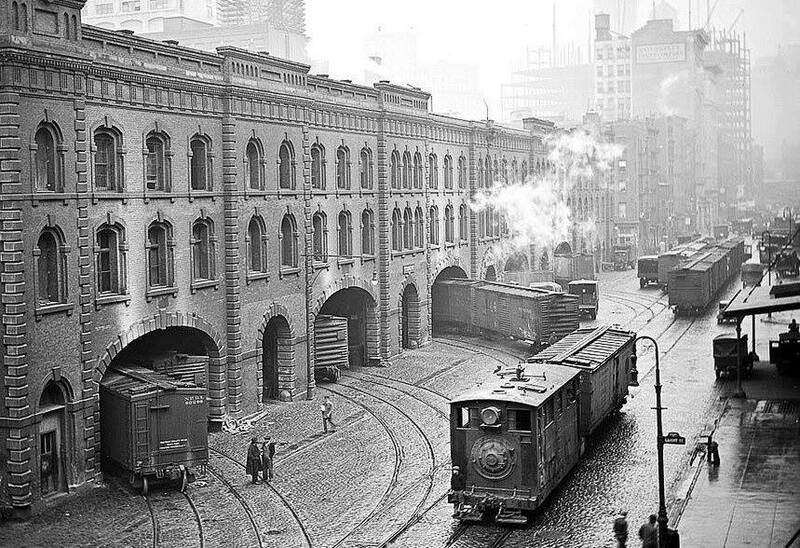 "Hudson Street and Laight Street, St. John's Park Freight Terminal (N.Y.Central & Hudson River RR) Early 1900's." 1) Each track could hold 1 or more cars behind the backdrop, whatever suits the space. 2) If you wanted didn't want to switch them and just want run trains along the street, you could get some cheap second hand box cars, cut the ends off and set them into a low relief backdrop. and of course you could use my 3D printed inset track, wonder what minimum radius you could get away with. It looks very sharp in photo, but photos can make curves look sharper. In fack looking at how narrow the space between main tracks and buildings, outside curve might equate to only 25cm, which radius used for tramways, with inside track radius 20.4cm. All very tight, but at least wagons don't have buffers to get in way. Getting trains to go round such sharp curves might be most difficult part. Getting Kadees to recouple on those curves will be nigh on impossible! Two points of interest on the photograph are that the tracks do not appear to enter and continue into the warehouse at a right angles. Each of a pair of tracks come off a different line/headshunt in the road, in a similar manner to a double junction. Hard to tell from the photo whether the street lines are just headshunts. The Loco is one of the New York Central Shay's I think, rather than a straightforward dummy. Interestingly, the smoke staining above the arches appears to be white! The smokebox (and thus by implication the boiler) appears NOT to be off centre. May I suggest comparison with this photograph? Kadees, no problem, just don't use them. They are not obligortary. Standard continental couplings would work fine, especially if loop was only on one end and the blade of grass type uncoupler used. The blade of grass uncoupler would be a bit out of place on a busy street! I only use that term Bob, because that is how Roger Nicholls originally developed it. I have adapted it to be a very thin piece up upright card, it could even be transparent. Having talked to Roger about his idea, even he says it tends to work better than Kadees. In this set up all sidings ae same way so couplings are allon same end, not that it is difficlt to do with sidings both ways. It is a lot simpler to do than building in electromagnets, which have been know to fail. It is also easier to move, should you find it is not in right position. Given the comments about Kadees on sharp curves, I think that unless you want to use more space that the prototype, then you need a couplings syste than cope with the sharp curves.